This site was excavated in 2006, ahead of the widening of the Route 3 highway between Nahshon junction and the Re’em junction. 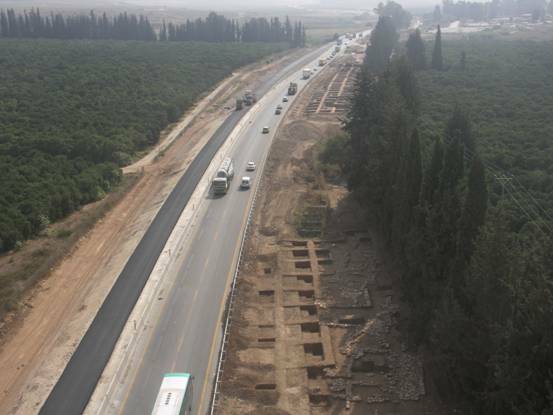 Following test digging conducted by the Israel Antiquities Authority, two areas were opened for full excavation: the larger – a low tel – was dug by the Israeli Institute of Archaeology (Tel Aviv University), while the smaller area was excavated by Y.G. Contract Archaeology in a depression just west of the low tel. The area excavated by Y.G. Contract Archaeology yielded occupational and industrial remains dating to the Middle and Late Bronze Ages (ca. 1800-1300 BCE). 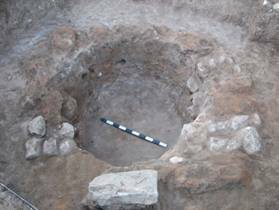 Three clusters of architecture and activity were identified: two domestic compounds and one open area of pits, basins and other installations containing slag, bellows and pottery – indications of a ceramics workshop. The artifactual finds include domestic assemblages of the Middle Bronze Age I, II and III, Late Bronze Age I and IIA. Aside from the slag and bellows fragments from the workshop, we recovered ceramic vessels (only five of them complete), an LB plaque figurine, ground stone objects and flint tools. Many hundreds of storage jars from all phases are also represented. 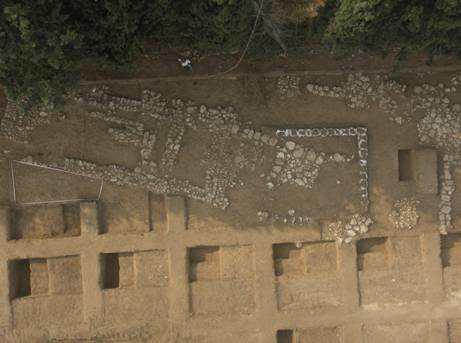 It seems clear that commodity storage – probably oil and wine – was a major activity at this site.